Content: 70% ecological blueberries, 30% natural apple juice. 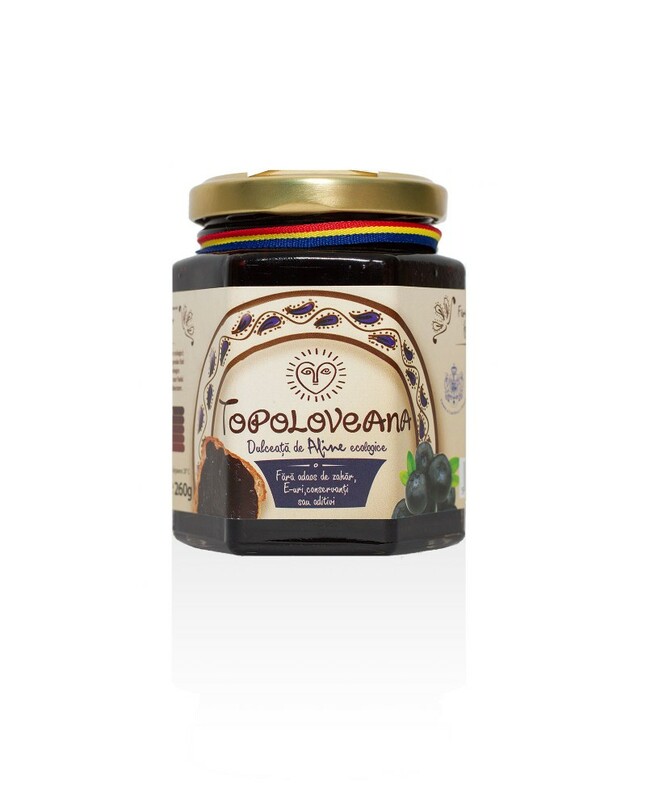 Topoloveni Ecological Blueberry Gourmet Confiture – 230 g.
Nutritional qualities: The Ecological Blueberry Gourmet Confiture has medium energetic value (251 kcal/100 g), content of food fibers of 3,2%, antioxidants and vitamins. Awards: Ecological Blueberry Gourmet Confiture was awarded by International Taste & Quality Institute Brussels with the Superior Taste Award Two Stars in 2012, it received the “Quality Brand” (from National Centre for Comparative Tests) and the title of Official Supplier of the Romanian Royal House . Benefits: It is known that Blueberries provide protection for the heart for people who suffer from metabolic syndrome, prevents cholesterol deposit in blood vessels and blood clots in the arteries. Also its prevent high blood pressure, protect the human brain against oxidative stress and reduce some conditions occurred with age (such as Alzheimer or senile dementia). The product is also recommended for diabetics. Blueberries prevent diabetes due to the content of glucochinine, which reduces sugar level in blood vessels and insulin addiction. Blueberries prevents infections due to the proanthocyanidin that anihilate the colibacili that causes the urinary tract infection and because of the flavonoids that protect the capillary walls and the human body against infections.